Lake Koman is not a natural lake, but a reservoir with at least two dams and power stations. After they were built and a vast valley area covered with water, a ferry service was established to serve the local villages. 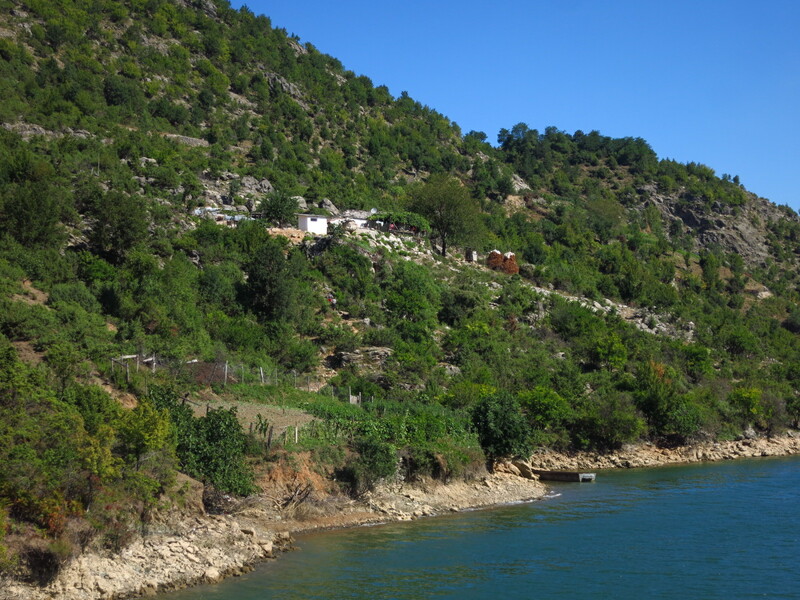 Now, it is important to put that statement in the right perspective – this is Albania we are talking about, so when I say ‘villages’ I mean one or two houses at most and the ferry itself was quite an adventure. 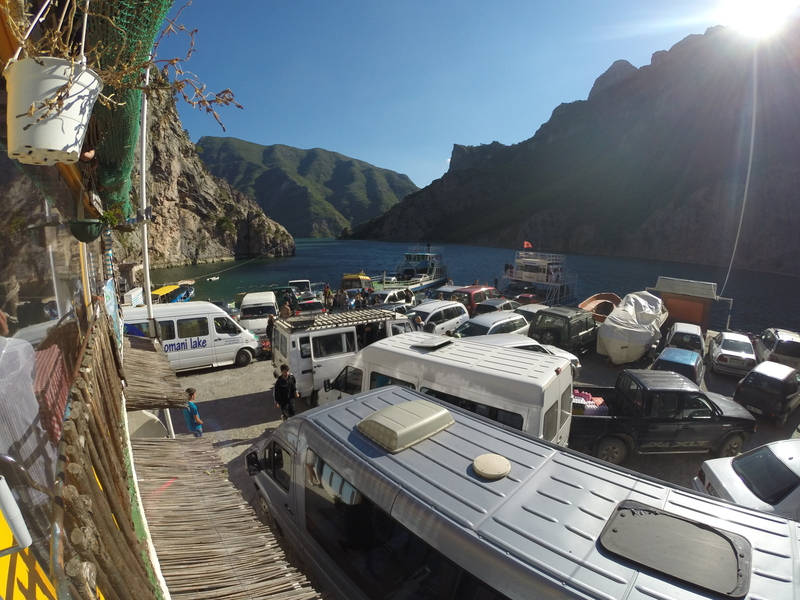 We had seen that there was only one ferry per day to Fierzë, leaving at 9:00 and we made it to Koman with about 20 minutes to spare. The road there had been a similar affair to the one in the natural park the day before, only this time it did not turn into a dirt road even thought it was so damaged at some points that it was close to it. At the foot of the Koman lake dam it went into a tunnel cut in the rock which according to the map lead to the reservoir and the ferry docking point. 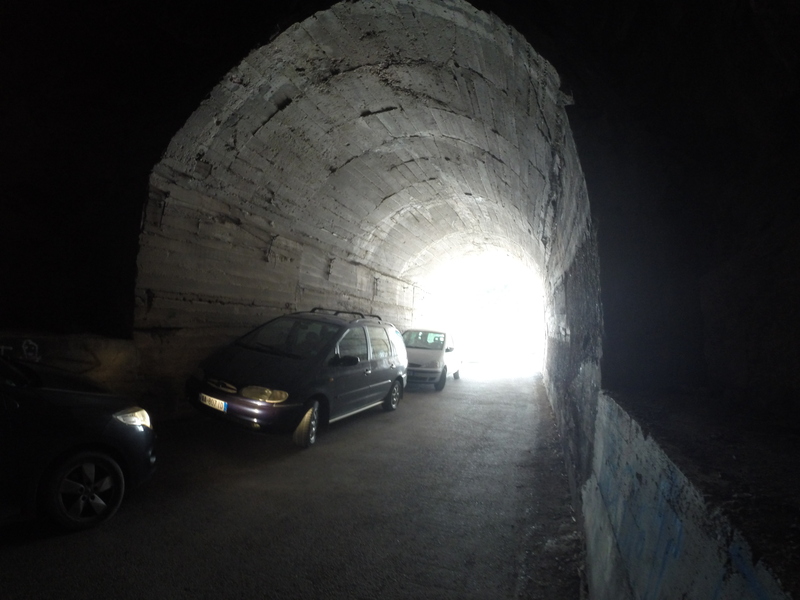 Just before the end of the tunnel we saw cars stopped and a van that was blocking the way out onto the dock and seemed to be unloading passengers, so we stopped and waited for it to finish. Before I had time to go and have a look outside the tunnel a guy who seemed to be working for the ferry walked up to us and asked whether we had booked tickets for the crossing. Erm… no, we did not know that we could or had to book in advance, but seeing that in about five minutes six or seven more cars had arrived and parked behind us in the tunnel, I started to worry about it. ‘No problem, no problem, I find you place, I call you’ said the guy and went out of the tunnel again. The van had finished unloading passengers but it was not moving, so I decided to go out onto the dock and see what the situation was like. I walked out of the tunnel and found myself in the middle of complete and utter chaos. The dock was tiny, and there were more than a dozen cars and vans with whole families and even animals in them, parked with no apparent order at all, pointing in all directions and covering every inch of space available, it was like a Tetris game gone very, very wrong. On the water there were two car ferries and a passenger one, half full of vehicles that wanted to get off but could not, and I was standing right in the middle of all this, watching the scene in motorbike clothes and eating a banana we had just bought from a street vendor. I could not have looked more out of place. In what can only be described as the most amazing combination of life-size tile puzzle and logistics, the ferry guys, moving one car at a time into gaps they made out of nowhere managed to get the cars off the ferries and down the tunnel, some of them in reverse until the other end, no mean feat considering that the tunnel was long, steep and with corners inside, and started loading the waiting cars. The dock itself was very basic, the ferry loading ramp was very narrow and there was a huge gap between the both that some guys had tried to cove with an old mooring rope. Cars went on board bumper to bumper, and the staff even lifted the back of a VW to push it closer to the railings and make room for one more car that went on sideways and with one wheel left on the ramp. Most people were locals and seemed used to it, but this last car belonged to an old Swiss couple that nearly had heart attack trying to get it on board. Once the operation was complete the guy from earlier came to find me and said that there was room for the bike. I looked and the only room was a tiny gap next to the loading ramp. The ferry’s old diesel engine was already coughing into life, and he urged me to go get the bike. There was no corridor left in the dock, the space that had been created to unload the cars had been filled again with more cars that kept coming, so I had to zigzag around bikes, down behind a small car, up in front of it, over a mooring rope, down the slippery ramp and sideways onto the wooden deck wedging the bike between the post that held the ramp cable and the VW. The deck was not flat there, so I could not leave the bike on the side stand because it would fall on the VW, and there was no room to pull it back onto the centre stand. The guy who was helping me keep it standing gestured to me to tie it to the ramp post, but gave me no rope. The ferry was already pulling back from the dock, so I was left on my own to undo one of the straps holding the rack bag and tie the bike to the post while pushing it with my body to prevent it from falling over and trapping me against the VW. With the bike seemingly secure, albeit too close to the edge of the deck for my peace of mind, I went to the upper deck to enjoy the journey. Full to the limit of its capacity, the ferry started to slowly move over the surface of the lake against the strong morning wind, with the water line worryingly close to the deck. There were no life vests nor floats, and the boat literally seemed to have been built welding together pieces of scrap metal and using old truck parts. It was quite an experience. The dock in Fierzë, which we reached after a three hour long journey comparable to a cruise in the Norweigian fjords, had a lot more space but to be honest, there was no dock. The ferry just came as close to the shore as possible and lowered the ramp on a slope of gravel and rocks. The cars made it out the best they could, wheels spinning and the crew pushing, and then we pushed the bike backwards up the shore. Glad to have made it in one piece, we left the dock ad stopped at the first restaurant we found, where a very nice waiter offered us half a kilo of fish just caught from the lake. A welcome feast after the ferry experience. From the dock to the border the road was excellent, and we made it to the next country in no time. A few posts ago I said that you should always listen to advice from the locals when travelling. Unless, apparently, said local has left the country in search of a better life. 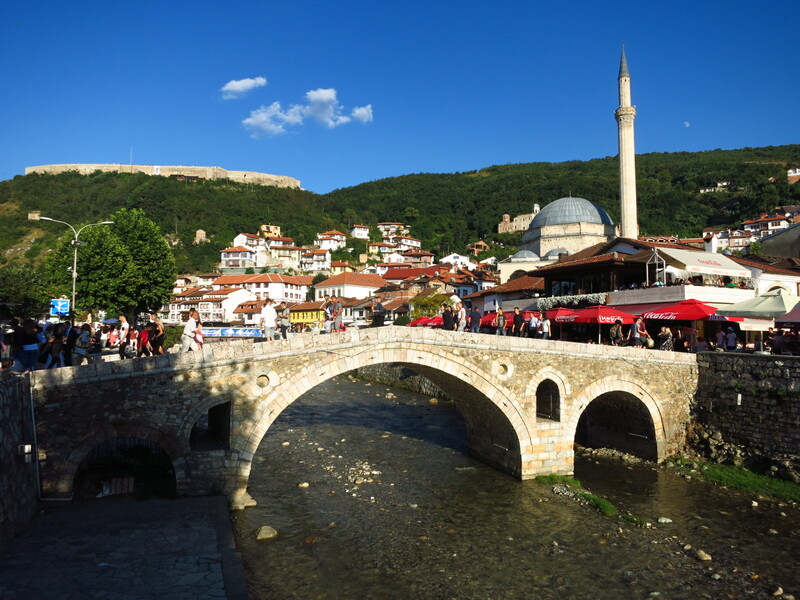 A very good friend of mine works for the EU in Brussels and when we told him about our intention to visit Kosovo he very kindly asked about the country on our behalf with a colleague of his who is from there. She said that there was ‘poverty, misery and nothing to see’ there. 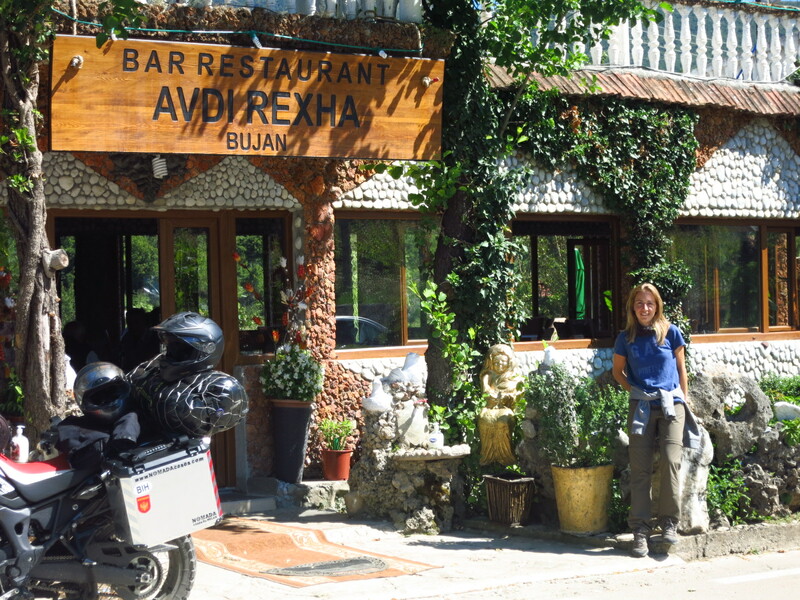 Well, I am happy to say that at least in the southern part of the country the landscape was beautiful, I had a great ride from the border in the mountains to Prizren, were we were spending the night, and the city itself was a very pleasant surprise, the old town bustling with life in small bars and street cafés and restaurants, surprisingly similar to Sarajevo. 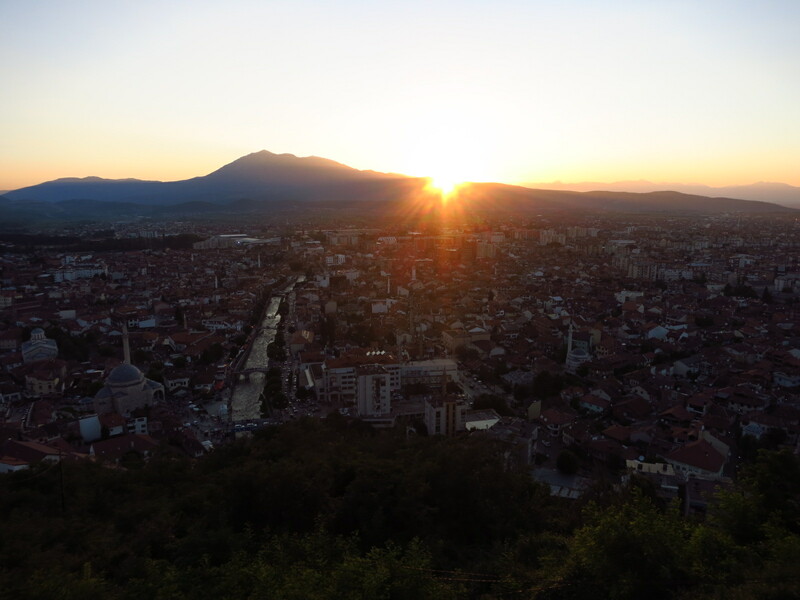 We walked up to the town fortress from where we enjoyed a stunning sunset with the sound of live music from a band that was giving a concert there, and had dinner in one of the restaurants in the old town before heading to the hostel, where they had provided space in a car park with CCTV for free. 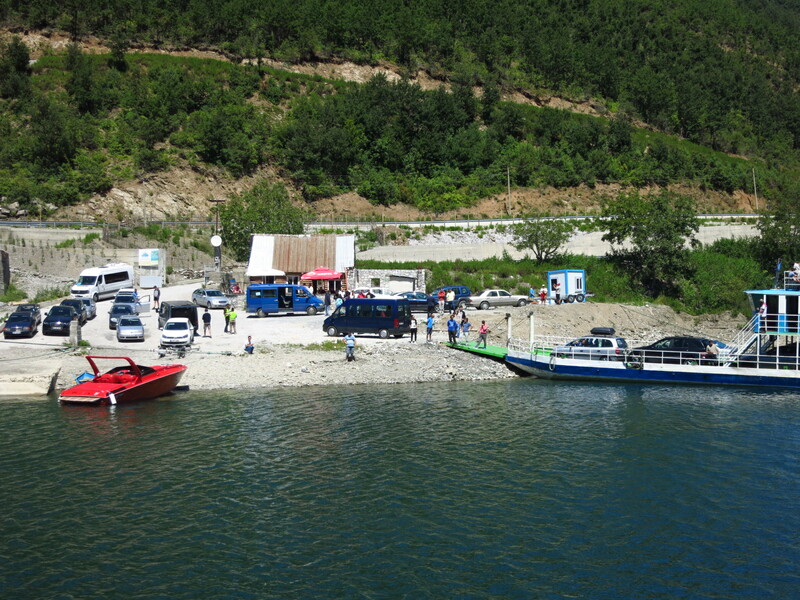 This entry was posted in Balkan Adventure 2016, Travel and tagged Albania, Fierzë, Koman lake, Koman lake ferry, Kosovo, Prizren by Kilian. Bookmark the permalink.